A Review of Tal Ronnen’s CROSSROADS cookbook. Vegan food on its own is not inherently boring. But if a chef doesn’t know how to prepare plant-based food correctly, he’ll repeatedly churn out boring vegan dishes as an afterthought. This not only perpetuates the notion that things like undressed lettuce and tomatoes is an acceptable vegan meal, but it’s also a completely missed opportunity to create some really fantastic, inspiring food for those who love to eat. That’s why the world needs great plant-based chefs like Tal Ronnen of Crossroads Kitchen in West Hollywood, who are revolutionizing the way plant-based food is prepared and perceived. Tal Ronnen‘s cooking has been a great source of inspiration to me in my own kitchen for the past several years. His first cookbook, The Conscious Cook, showed me that blending raw cashews with water makes something called cashew cream (sounds super simple now, but several years ago, that was new, mind-blowing, life-changing information!) and slicing king oyster stems can make a pretty convincing vegan scallop. His tight plating, insane knife cuts and ability to make any plant shine on a plate keeps me constantly intrigued by his work. 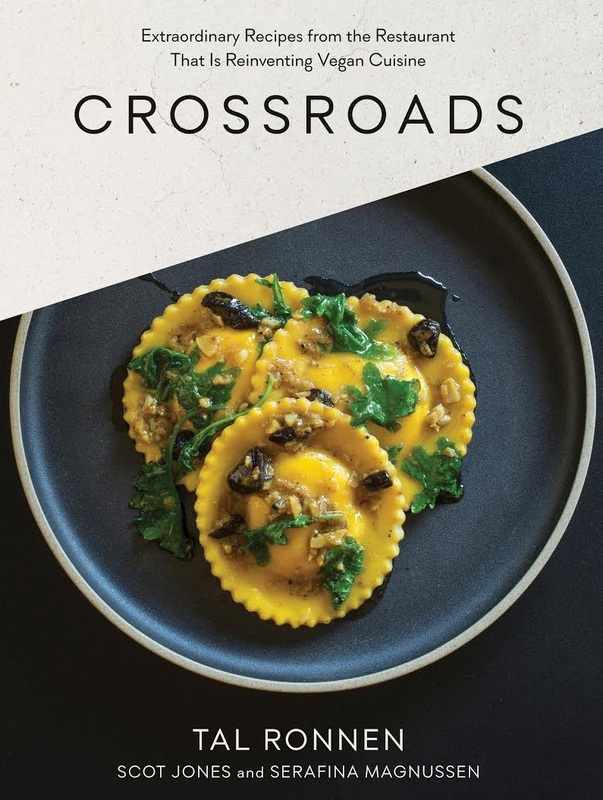 So when I heard that Chef Tal was coming out with a second cookbook, CROSSROADS, which shares the same name as his refined but relaxed restaurant, I was very excited to see what kinds of dishes it would include. Whereas The Conscious Cook is focused on applying traditional French culinary techniques to meatless cuisine, CROSSROADS shifts its focus over to Mediterranean cuisine, which is a reflection of the food he currently prepares and serves at his restaurant. CROSSROADS is for those who love the process of cooking and delight in the the smells, colors and textures of whatever they’re preparing. Dishes like Acorn Squash Ravioli with Kale and Black Garlic Butter Sauce, Grilled Garden Vegetable Lasagna with Puttanesca Sauce, Tortellini with Sun-dried Tomato Ricotta and Sweet Peas and Hearts of Palm Calamari with Cocktail Sauce and Lemon-Caper Aioli guide those who love to cook to produce gorgeous dishes that step outside of the ordinary to create a unique experience at home. I started off with Chef Tal’s Spicy Moroccan Carrot Salad with Chili and Cumin (see recipe and notes below), that involves blanching carrots (which I’ve never done before, but will definitely try again! ), marinating in a blend of chilis, red wine vinegar, cumin and a few other components to produce a vibrant and gorgeous dish bursting with flavor and and boasting an amazing array of textures. … or do both to increase your chance of winning! The winner will be chosen at random on Sunday, January 24. Shipping is limited to US/Canada only. Good luck! The winner of this giveaway is Holly, congrats! Thanks to everyone who entered! This recipe has sentimental meaning for me—it is an ode to my childhood nanny, Sol. Both of my parents worked full-time, so for the first eight years of my life, my sisters and I were like Sol’s adopted children. Sol came to Israel from Morocco in the mid-1950s, and years later, thankfully, she found her way to the Ronnen household. Her cooking was so different from the food we knew. 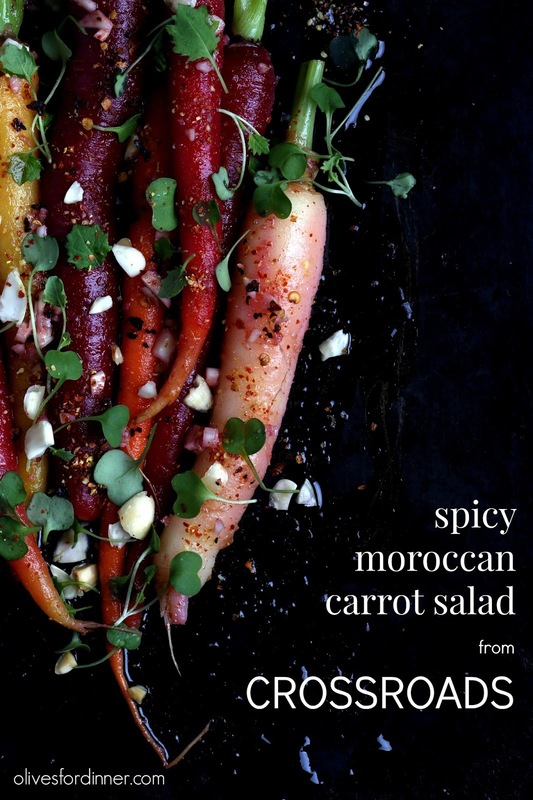 Sol’s was laced with chilies and spices, and her carrot salad was a mainstay on the table. She made this dish with sliced carrots and a type of chili pepper that, sadly, isn’t available outside Israel. 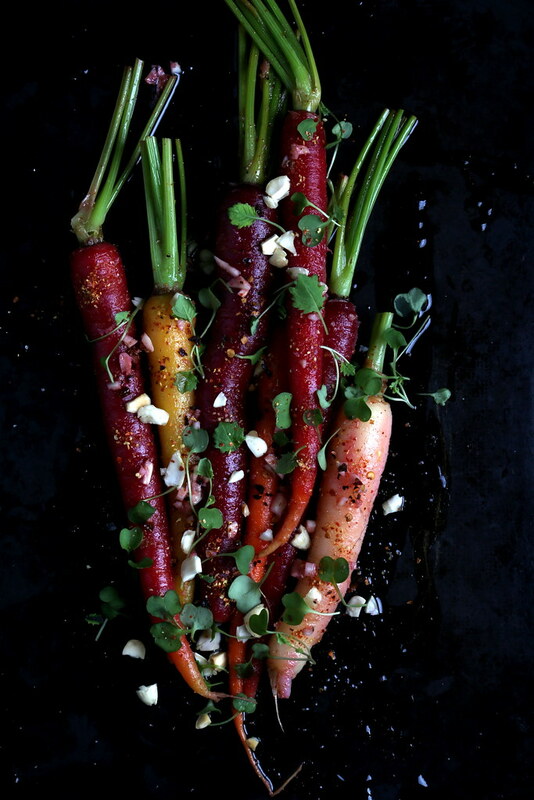 So I restructured her killer recipe using whole rainbow carrots and guajillo chilies. To prepare the carrots: Bring a large pot of lightly salted water to a boil over high heat. Prepare an ice bath by filling a large bowl halfway with water and adding a tray of ice cubes. Blanch the carrots in the boiling water until tender when pierced with a knife, about 3 minutes. Drain the carrots and plunge into the ice bath to shock them—i.e., stop the cooking and cool them quickly; this procedure also locks in the carrots’ bright color. Drain the carrots again. You want them to be relatively uniform in size, so if any of them are large, cut them lengthwise in half. To prepare the marinade: Put a small dry skillet over low heat, add the chilies, and toast for 1 or 2 minutes; shake the pan so they don’t scorch. Break up the chilies and put them in a food processor. Pulse the chilies to a coarse powder; you should have about ½ cup. Put the chili powder in a mixing bowl, add the vinegar, garlic, cumin, kosher salt, black pepper, and red pepper flakes, and whisk until blended. While whisking, slowly pour in the oil in a stream until emulsified. Put the carrots in a mixing bowl and pour in the chili mixture, tossing to coat. Marinate for 1 to 2 hours, tossing periodically. To serve: Crisscross the carrots on a platter. Scatter the micro greens and almonds on top and season with flaked sea salt. Hearts on Fire is a variety of micro greens with garnet-colored veins and stems. They not only give stunning color to a dish but also add a vibrant tart, citrusy flavor, reminiscent of sorrel. Popular in Spain, Marcona almonds are softer and sweeter than regular almonds and have a more rounded shape. Their rich, buttery flavor is due to the high oil and moisture content. Store the fried almonds in a sealed container at room temperature for up to 3 days or in the freezer for up to 3 months. Put a cast-iron or other heavy skillet over medium-high heat. Pour in the oil, add the rosemary, and stir to infuse the flavor into the oil. Heat the oil to around 300°F. (You don’t need a thermometer for this: Drop an almond into the oil. When it sinks a bit, then floats right back to the top and starts sizzling, the oil is hot enough.) Once the oil is ready to go, add half of the almonds and cook, stirring constantly, until they are fragrant and toasted, 10 to 20 seconds. Using a slotted spoon, remove the almonds from the oil and drain on paper towels. Sprinkle them with the salt while they are hot. Repeat with the remaining almonds. Use to top the marinated olives or serve as a snack. I don't make it nearly often enough, but your vegan palak paneer recipe is one of my all-time favorites. Any kind of curry!!! Thats basically all i eat now, the possibilities are endless!!! I have so so many favorite plant based recipes but when I really want to make vegetables the star I opt for salads with grains and seeds and nuts and bowl combinations like marinated lime tofu, black beans, rice, cilantro, avocado with cashew lime sauce/dressing … this book (and restaurant) look amazing! On my wish list for sure – both of them! I am on a sandwich kick lately, so vegan sandwiches are my current favorite. I love soup. One of my favorite recipes is a lentil, tomato, kale soup with just enough spices to pop the broth. So good. I love making variations on beet salad– lately with goat cheese, oranges, and a splash of red wine vinegar. What about a whole roasted head of cauliflower, basted with almond butter? I love Crossroads. I don't know how Tal does it- a mad genius. Thanks for sharing the recipe! I'll be making this for a family dinner coming up.